John Bercow: What does Speaker's ruling mean for Brexit? 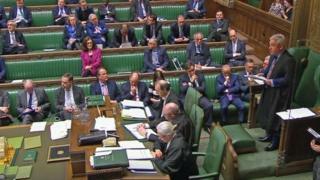 The Brexit saga has taken another unexpected twist after Commons Speaker John Bercow said he would not allow another vote on Theresa May's withdrawal deal unless MPs were asked a different question. His dramatic intervention, described as a "bombshell" by many newspapers, came at a crucial moment in the process, with 10 days to go before the UK is scheduled to leave and the prime minister set to ask other European leaders for extra time to address the the current deadlock. Mrs May had been planning to hold a vote this week, ahead of the summit - provided she could convince enough of her own MPs and Northern Ireland's Democratic Unionist Party to back it. The Speaker referees debates in the Commons chamber, often stepping in to shout "order" or rebuke an MP deemed to have broken the rules. The Speaker also calls MPs to speak and plays a behind-the-scenes role as chair of the Commons Commission, which is responsible for maintenance and other services on the Parliamentary estate. The holder of the office is an MP who has been elected by other MPs - and he or she is meant to remain politically impartial at all times. John Bercow, a former Conservative MP, has been Speaker since 2009. Unlike many other countries, the UK does not have a written constitution - procedures in Parliament are dictated instead by longstanding customs and traditions, which can be open to interpretation. When there is a constitutional crisis, of the kind that has blown up over Brexit, it falls to the Speaker to make rulings based on decisions made by their predecessors. What did John Bercow say? In a nutshell, he ruled out another vote on the withdrawal agreement negotiated with the EU if the motion put to MPs was "the same or substantially the same" as the one they rejected last week. MPs said no to Mrs May's deal a week ago by 149 votes, having first rejected it in January by 230 votes - the biggest ever Parliamentary defeat for a government. The Commons Speaker suggested there would have to be a "demonstrable change" to the deal put before MPs to allow another vote. Explaining his decision, he cited "strong and longstanding" parliamentary precedents dating back to 1604. Referring to Erskine May, Parliament's ancient and respected rule book, he said MPs should never be asked to vote again on the same proposition if they had already "negatived" it during the current Parliamentary session. He gave a number of examples where predecessors of his had enforced this convention, the most recent being in 1920. He was asked to look into the matter by a Labour MP, although he had been expected to make an intervention in the Brexit process at some stage, as it has strained Parliament's normal procedures to breaking point. After the PM's deal was rejected for a second time, Labour's Angela Eagle asked the Speaker to rule whether it would be proper for the Commons to be asked to vote on a deal again that it had decisively rejected twice. Mr Bercow promised to go away to consider the matter and let MPs know. In reaching his ruling, he said he was acting on concerns that MPs could find themselves "repeatedly" having to vote on the same proposition "ad infinitum". This, he said, was not a "sensible" use of Parliament's time. He said it also risked undermining the legislature's reputation which depended, in part, on maintaining "proper respect for the decisions it takes". He asserted the Speaker's right to decide, at the time, whether future motions were in order or not. While it was not his "last word on the matter", he made clear he was setting a test that governments, and also MPs tabling Brexit-related amendments, would have to pass in future. The timing of Mr Bercow's announcement could not have been more politically explosive. The immediate consequence is that it has pretty much ended any chance of there being another vote on the PM's deal this week. Theresa May had been hoping to hold a third vote on Wednesday which, if successful, would have paved the way for her to ask for a short "technical extension" of about three months to complete the Brexit process. Although the prospect of her getting the deal through was far from guaranteed anyway, Mr Bercow's intervention would seem to have pretty much derailed, for now anyway, No 10's preferred sequence of events. The PM is now having to contemplate asking EU leaders on Thursday for a much longer delay, of potentially nine months or more - pushing the date of Brexit well beyond 29 March. MPs could still vote on the deal again next week, if it has been changed - or the Speaker has been overruled by MPs in a vote - but the political landscape may look very different. Ranging from apoplectic to ecstatic, depending on which MP you speak to and where they stand on Brexit. Conservative MPs who had been persuaded to back the PM's deal, in a vote they expected this week, are particularly aggrieved. James Gray said he was "absolutely furious", while Greg Hands suggested Mr Bercow was one of the few public servants who was "genuinely accountable to nobody". Ardent Brexiteers who want the UK to leave without a deal seemed initially pleased, believing it would either force the EU to make more far-reaching concessions to the deal or scupper the chance of there being another vote and therefore make a no-deal exit next week more likely. The Labour leadership has stayed out of the row so far. But Labour, Lib Dem and SNP MPs who favour a "softer" form of Brexit or even a referendum sense a growing opportunity if the current deadlock drags on. Amid all the excitement, ex-cabinet minister Sir Oliver Letwin expressed a rather different view, saying the development "was not terribly important" since MPs would be able to re-organise their business, known as their standing orders, to allow another vote if they wanted one. All eyes are now on Thursday's summit of EU leaders, where they will discuss what to do next. Their decisions are likely to shape what happens in Parliament next week. If the EU agrees to an extension, MPs are likely to be asked to approve re-writing the Brexit date. Whether the government tries to bolt another vote on the PM's deal onto this remains to be seen. Some people think this could happen if alternative ways of getting round Mr Bercow's ruling - such as changing standing orders or even terminating the session of Parliament early - are deemed too difficult. Nikki da Costa, a former director of legislative affairs at No 10, has suggested there could be two votes - one in which MPs are asked to over-ride the conventions outlined by the Speaker and another on the deal itself. Brexit Secretary Stephen Barclay has also hinted at this, telling the BBC that while he "respected the referee's decision", MPs would always "find a way" of expressing their will if the circumstances changed.